Here are a few more examples of different hair styles, this time focusing on hair that has been pulled back in ponytails. I don't have much to say about it; I just thought that I should put these in their own section since I had so many of them drawn up. Just remember that when the hair is pulled in a specific direction, the lines and strands of the hair are drawn in that direction, too. Now, here is the tough part: putting your character's hair into motion. I'm going to start by going over some examples with long hair. Anime hair is often drawn whipping about dramatically in the wind; it may look difficult to draw at first, but it isn't that bad. First, decide which direction you want the hair to be blowing. Do you want the hair to move to the sides, to be blown back behind the character, or pushed forward in front of the character? 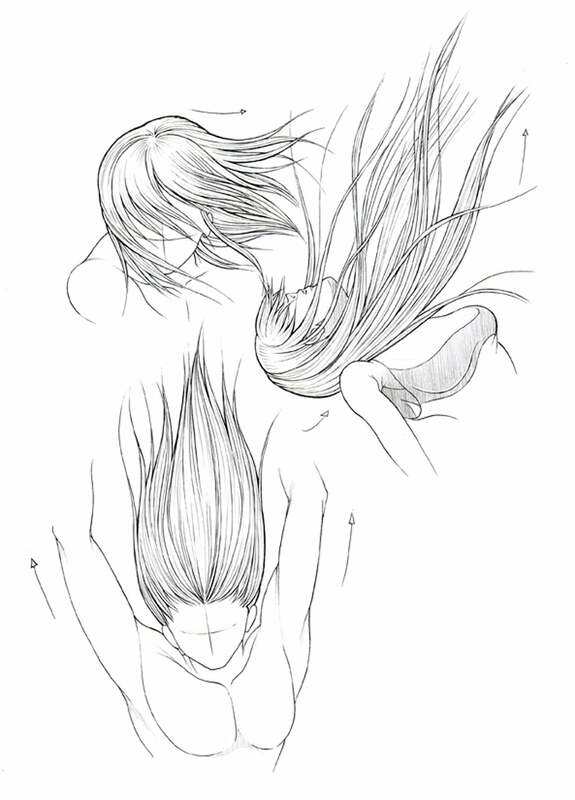 Once you decide, draw the hair (all the hair; bangs move along with the rest of the hair) moving in that direction. It is similar to drawing the hair falling straight down the character's back, except now you are curving it in a different direction. The lines of the hair and each individual strand will be pulled in the direction that the entire mass of hair is being drawn. Remember to use curved lines that follow the form of the hair, not straight lines that simply go from one end to the other. 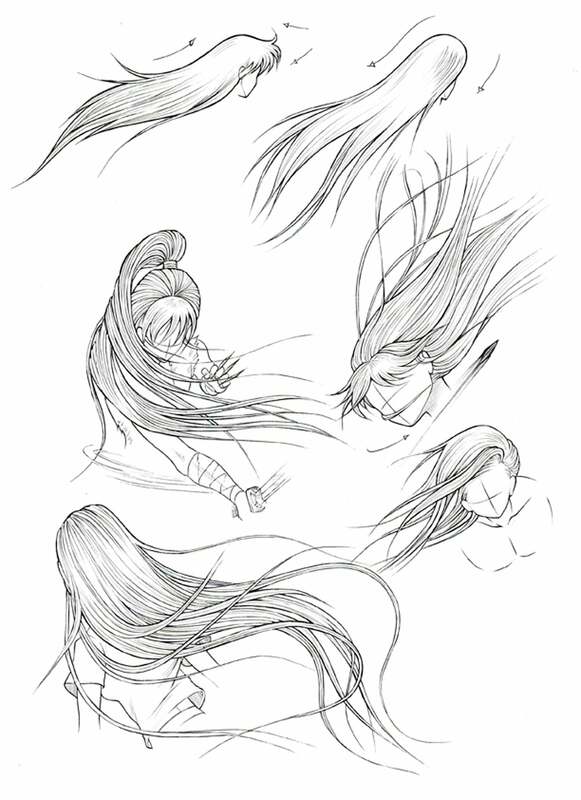 For example, on the topmost right picture, the character's hair is being swept back behind him; thus, I drew the hair curving back behind him in nice, sweeping lines. For some really nice examples of similar hairstyles, find some CLAMP manga such as Rayearth or X/1999; they're loaded with characters with beautiful, sweeping hair. ^__^ All these examples were borrowed from CLAMP's RG Veda, by the way (I was working on this tutorial in the library, and RG Veda was the only manga I had on me... ^_^;). Well, those examples are all well and good if you are drawing a character with really long hair, but what about shorter hair? Shorter hair can be easier, since there isn't as much of it to draw, but it can also be difficult because you sometimes have to pay more attention to each little strand. 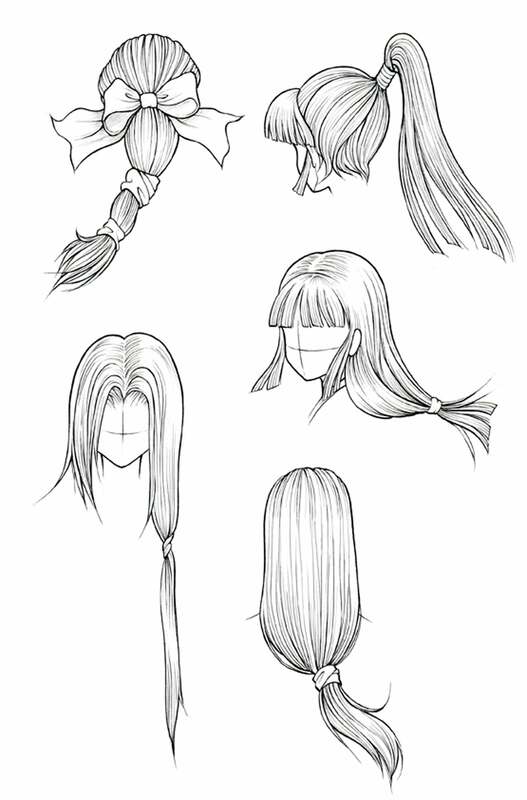 In these examples (again, borrowed from CLAMP :3 ), the characters all have shoulder-length hair, swooshing about in various directions. 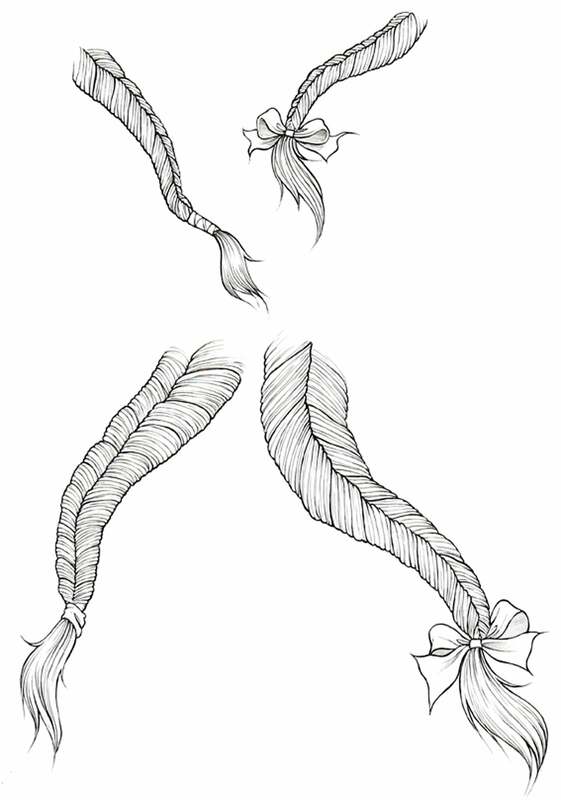 Take particular notice of the top example; the movement on the hair is slight, and thus not all of the strands are bent in the same direction. You don't have to have all the hair jutting out in one direction in order to indicate motion. In the bottom example, notice how having the strands not all move in exactly the same direction gives the hair an interesting floaty feel. And I know I didn't go over how to shade hair; you needn't remind me. Hopefully I'll be able to address that subject in the future, but I can't promise anything.